It was the night of the premiere. We were running late and I was sure we’d be stuck in the neck-breaking front row of the theatre, if we got seats at all. 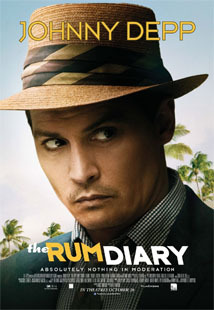 The movie we were rushing to see is called The Rum Diary. Based on a book of the same name by Hunter S. Thompson, The Rum Diary tells the story of a journalist who travels to Puerto Rico to work at a failing newspaper. Thompson based this story on his own experience in Puerto Rico but used an alias to protect himself. This is the second book by Thompson that has made it to the big screen. The first was Fear and Loathing in Las Vegas, released in 1998. Fear and Loathing was a hit with Thompson fans and became an instant cult classic. Johnny Depp played the role of Thompson, or rather, his aliases, in Fear and Loathing as well as The Rum Diary. Depp and Thompson had known each for some time before Fear and Loathing was made and, before filming, Depp did extensive research into the role. He spent months shadowing Thompson and getting to know him better. The two became very close during this time and maintained their friendship until Thompson’s death in 2005. Now, when a book is made into a movie, it’s to be expected that some of the story will have to change. Details may be omitted and things may be added to make the story more Hollywood-friendly. I kept this in mind when I watched The Rum Diary but I can now say that some books, this being one of them, should be confined to the pages on which they were printed. They shouldn’t be allowed to traipse onto the big screen only to bore people and sully the name of a literary icon and his work. I had hoped that, with the social status and film repertoire that he has, Depp would have been able to influence the film in a way that would avoid such a catastrophe. I’m honestly surprised that he stood by and allowed the release of this insulting parody. Considering that the story was tailored to fit the big screen, it still felt an awful lot like watching a book. Slow paced movies aren’t for everybody, but I’ll gladly watch one if there’s a clear direction. In this case, I would’ve been satisfied with an attempt at staying true to the original storyline. But alas, that would be asking too much. The story was cut past the point of acceptable omission. Missing key parts at the beginning, at the end and throughout, the story wandered aimlessly. Depp did stay true to the role though, he played a good Thompson. But it wasn’t enough. I doubt the movie would have been much more watchable if Thompson himself had risen from the ashes and acted in it. When I finally did arrive at the theatre on opening night, I was surprised to find many open seats. In fact, more than three-quarters of the place was empty. This turned out to be the only good news of the night, as I can only hope this movie is a flop and fades away into obscurity so that as few people as possible get tricked into believing that this is who Thompson was. My advice to anyone who had considered going to see this movie: stay home. Better yet, go to Chapters, where, for less than the price of a movie ticket and a bucket of popcorn, you can pick yourself up an unadulterated copy of a fine book called The Rum Diary.